Water damage is nearly unavoidable for homes and buildings. From rain to flooding to leaks, many things can cause water damage, making it one of the biggest problems for building materials. As water damage spreads and remains untreated, it becomes more serious and can result in permanent damage. As such, it’s important to tend to water damage immediately. 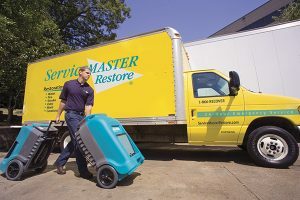 ServiceMaster by Restoration Contractors is a local business that provides professional water damage restoration services in New Haven and Northeastern Indiana. We have been in this business since 1975 and have experience with commercial and residential properties, so we can ensure our services are effective and satisfactory. Our water extraction and drying equipment remove water from damaged areas, eliminating the water from the structure and excess moisture in the air. When water spreads through porous materials, it can lead to severe water damage — regardless of the amount of water. When water is absorbed by carpeting, drywall, flooring, and other surfaces, such surfaces can become discolored, swell, and warp. A building’s structure can also become permanently damaged. If left untreated, the damaged area starts to smell. The musty odor it gives off comes from a combination of bacteria, cellulose, and excess moisture in the porous materials. Mold then becomes a problem, forming within 48 hours of the damage. The mold scatters its spores throughout the air and affects new materials. That said, it is vital to contact a water extraction specialist immediately. We offer customized plans that best fit your home’s or building’s needs. 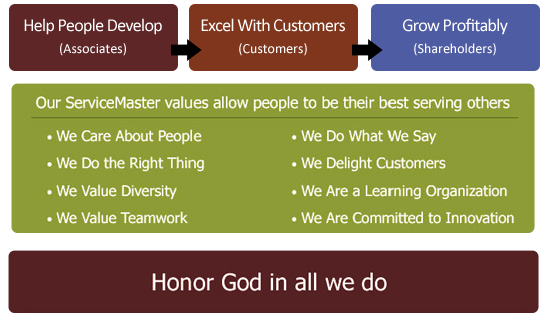 This allows you to make the most out of our services. Any questions concerning our plans for water damage services can be addressed by calling our emergency service number at (260) 420-1502. The technicians we employ at ServiceMaster by Restoration Contractors use state-of-the-art water extraction equipment and techniques, so they can work with all kinds of water damage. We can remove any amount of water, like standing flood water, and will restore furnishings and surfaces damaged by water. Call ServiceMaster by Restoration Contractors once water damage is initially spotted to prevent further spreading and damage. Get rid of excess water by mopping or blotting dry surfaces. Only remove temporary flooring, not permanent flooring or carpeting. Make sure drapes aren’t touching the floor by hanging the bottoms up on the rod. For furniture, wipe away excess water and place aluminum foil between the legs and carpeting. Store important documents, valuables, and photos in a dry, safe spot. Pack any water-damaged books tightly on their shelves to ensure they keep their shape until they can be dried using a specialized drying process. Open the doors in your home or building to fasten the drying process. Do not walk in rooms that have standing water unless the power is off. Do not rid of water with a standard vacuum. Do not extract permanent flooring. Do not use any appliances unless such appliances are considered safe to use and the space is dry. The sooner water damage can be treated, the better, because there’s less time for the damage to spread and worsen. Knowing this, we, at ServiceMaster by Restoration Contractors are available to provide water damage restoration services 24/7 in New Haven, IN. We will respond to customers as soon as possible by arriving to a home or building in a timely manner with all the equipment necessary to treat the water damage and restore properties to its original condition. Get a FREE quote by calling us at (260) 420-1502, where we are available 24/7 to start the water damage restoration process immediately.